It's the start of another working week, so I needed to do some baking for work. It was a no brainer that I had to make somthing containing ricotta, as I had an unused tub of it languishing in my refrigerator that was getting very close to its use-by date. After a quick Google search, I came across this recipe for Ricotta Pound Cake on Megan's Cookin, and she in turn found it on another blog. Needless to say, Megan's gorgeous photos and rave reviews made it easy to decide to make this cake. I needed the same amount of cooking time as Megan, being 35 minutes longer than stated in the original recipe. The result is a beautiful, smooth, moist cake with a slight tang to it. I upped the tang factor by icing mine with lemon icing (to hide the uneven top which resulted because the cake baked above the sides of the pan). What else can I say - this is a delicious cake. If you have some ricotta in the house, go make it! It's British Pudding Challenge time again, and for April, Rosie has selected a dish fit for a queen - Queen of Puddings, that is! For those who have never been lucky enough to try it before, the Queen of Puddings is a bread custard topped with raspberry jam and crowned by fluffy meringue, all served warm. You can find the recipe for this delightful pudding here. I have to say that this has been my favourite pudding challenge so far. The Queen of Puddings is light, sweet and altogether moorish. Yum! Thanks to Rosie once again for hosting this challenge. Elle of Feeding My Enthusiasms and Deborah of Taste and Tell are co-hosts of this month's DB's challenge - cheesecake pops. When I first saw this month's DB's challenge, my feelings were mixed. I love cheesecake, and the pictures of the cheesecake pops sure were cute; but on the other hand, the practical side of me was saying, "why?" I knew that it was going to take a lot of effort and a lot of mess to produce these bite-size treats, and when cheesecake tastes so good on its own, I wasn't sure that I could see the point. However, after completing this challenge, I can say, yes, it is time consuming; yes, it is messy; but boy oh boy, are these delicious!!!! These creamy, smooth bites of cheesecake on sticks are encased in a crispy chocolate shell (lollies optional), and the combination is rich, decadent and altogether other worldly. Elle and Deb invited us to use shapes other than round balls for our pops. I had grand plans of making flower shaped pops, and decorating them with ribbon with the sticks stuck in florist's foam in a vase to resemble a floral arrangement. Alas, I found that the cheesecake was too soft to allow this kind of frippery, so I opted for geometric shapes (rectangles, squares and triangles) instead. This allowed me to make the best use of my round cheesecake, because uniform shapes were not necessary. I used dark and milk chocolate to coat my cheesecake pops, not because of my brilliant forethought in planning for variety, but because my non-mathematical brain thought that 250g of dark chocolate equalled a pound. It was sheer luck that I had a block of Cadbury Dairy Milk in the cupboard that I could use to make up the shortfall in dark chocolate. However, as far as finished results go, the dark 70% cocoa solids chocolate was a clear winner, both in workability and taste. The milk chocolate was very sweet, and because I forgot to add shortening to it, it tended to thicken much quicker, which meant that it didn't go as far and gave less-than-smooth results as it set more quickly. 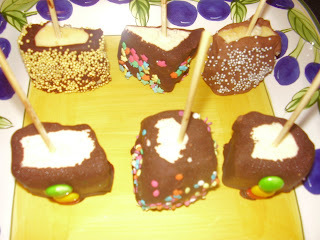 I sprinkled the chocolate-coated pops with a combination of lollies. 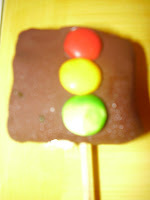 Some had red, yellow and green smarties arranged to make the rectangular pops look like traffic lights. These were my favourites, as I thought that they were kinda cute. 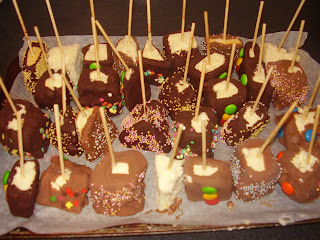 I had to work quickly when sprinkling the lollies, as the chocolate dried very quickly on the frozen cheesecake. 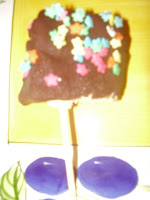 I found that it was a disaster to to attempt to roll the chocolate-coated pops in lollies to get a more even coating, as the chocolate tended to dribble all through the lollies, making a mess and ruining them for any other use. 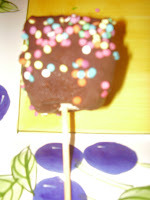 If you would like the recipe for cheesecake pops, it is available here. Thanks to Elle and Deborah for choosing such a cute and delicious recipe this month. Verdict - I loved the taste of these cheesecake pops, and would make them again in a heartbeat given an occasion warranting the expense and effort. Stephanie from Dispensing Happiness is hosting this month's Retro Recipe Challenge, an event established by Laura Rebecca. The theme for this month's event is Your Mother Should Know, and to participate, Stephanie has requested us to make a recipe from before our mothers were born. I have a cookbook called New Standard Cookery Illustrated, by Elizabeth Craig, which was published in 1933 (for the record, well before my mother was born). This book is over a thousand pages long, and is chock-a-block full of recipes of all kinds. It includes some doozies like Mock Turtle Soup, and an Australian section which tells you how to cut up a sheep or beef carcass and how to roast a black swan! While some of these recipes and tips are now for entertainment purposes only, there are some very sensible, basic recipes that are useful today. I didn't want to make yet another cake or batch of biscuits, as work is two days away and I already have sweets coming out of my ears (metaphorically speaking) at home. Accordingly, after about an hour of feverish flicking through New Cookery Illustrated, I selected a recipe for Exeter Stew. 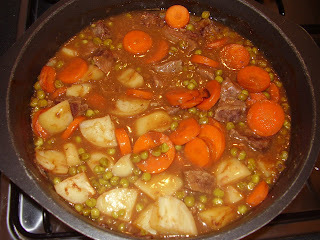 Although my stew, pictured at the top of this post, is not very photogenic, it is quite tasty. The strange whitish looking globs in it are dumplings, something which I have never made before. Although I am not a fan of the dumplings, it was fun to make them, and next time someone talks about stew with dumplings, I will know exactly what they are referring to. The recipe listed vinegar in the ingredients, which was not referred to in the method, and referred to stock in the method, but not in the ingredients! Accordingly, I have done some guess work in making this stew. Fry the beef in a well oiled frypan until brown, then remove from the pan with a slotted spoon and set aside. Brown the onions in the meat juices in the pan. Add the flour and season to taste, then add the stock. When the stock is boiling, add the browned meat to the frypan with the sliced carrots, reduce the heat and simmer for 2 hours. Check it every now and again to ensure that it doesn't boil dry, and top up with water as necessary. In the meantime, make the dumplings by mixing all of the ingredients except for the water together in a bowl, then add sufficient cold water to work the mixture into a smooth dough. Divide the mixture into 6-8 even pieces and roll in balls. After the meat has simmered for two hours, add the dumplings to the stew and simmer for another half an hour. Serves 6-8. 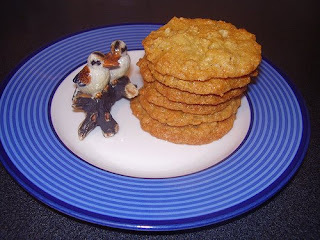 Thanks to Stephanie for hosting this month's Retro Recipe Challenge - it was rather fun to take a step back in time. One thing that always makes the daily grind of going to work a little easier is the prospect of a treat for morning or afternoon tea. At one of my workplaces, we used to have a roster for morning tea each Friday, where the two people rostered on brought in morning tea for everyone else. It was a great idea, but the system was often a little lopsided, because some people went to a great deal of effort (or at least, their wives on their behalf did! ), while others forgot altogether, or simply handed their morning tea partner $20 to do it all for them. I have always dabbled in a little bit of baking, but it is only in the last 3 years that I have really gotten into it, and I think that I would suffer withdrawal symptoms if I had to stop now. The work morning tea tradition gives me a great outlet to continue my baking without everything going to waste, and at the same time, it brings others pleasure (well, at least sometimes!). This week, I baked the work crew a lemon custard coconut cake. The recipe came from one of the Australian women's magazines - I am not sure which one, as I had scrawled the recipe down on a piece of notepaper. 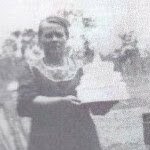 I had made this cake once before in "another life", and I had helpfully scribbled in pencil in the margin of the recipe that I needed to line the pan because this cake is a "sticker". I had also noted that it takes a good 20 minutes longer to bake than the recipe says and lo, it was true, even though I used a different oven this time. It was great to have a "helping hand" from the past to guide me through the traps. Preheat your oven to 180 degrees Celsius and grease and line the base of a 20cm round cake tin. Sift the flour and custard powder together, then add the sugar, coconut and zest and combine. Add the butter, milk and eggs, and beat until smooth. Pour the batter into the prepared cake tin, and bake until a skewer inserted in the middle comes out clean. (Both times, this cake took 55 minutes for me; the recipe says 35-40 minutes!). 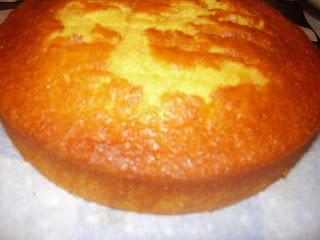 Cool the cake in its tin for roughly 5 minutes before turning onto a wire rack to coool completely. Once cool, make the icing by sifting the icing sugar and combining it with the juice and zest in a small heatproof bowl. Stir this mixture in the bowl over a saucepan of simmering water until it is of a spreadable/pourable consistency, and spread over the top of the cake. (I found that there was only enough icing for the top, and that you have to work quickly, as this icing sets fast.) 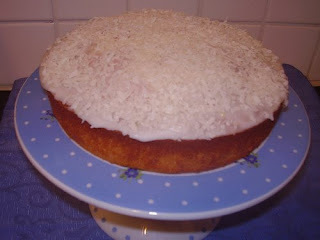 Decorate the top of the iced cake with shredded coconut. Enjoy! Gretchen from Canela & Comino is hosting this month's Think Spice event with a Cloves theme, which requires participants to create and share a dish containing cloves as the star spice. I have to confess that I don't use cloves often, so it was great to have the chance to research a recipe featuring cloves and what I had around the house (given that today is the deadline and it is a public holiday, so shopping is out of the question). Not only do I not use cloves very often, I also don't have much information to share about them. However, one thing that I do remember from primary school is that in times past, before the blessed era of modern dentistry, people used to chew on cloves to help relieve toothache. This does not exactly sound pleasant because cloves are rather bitter, but I guess if it helped to ease the pain, it was worth it. As for me, I think I will continue to visit my excellent dentist, Boris, for pain prevention. I have made Cranberry, Clove and Nut Muffins for this event. My dish contains ground cloves, and is more likely to promote tooth decay than anything else (hence necessitating more cloves?!?). The recipe is from All Recipes.com, and can be found here. However, I changed the recipe by substituting the cardamom for more cloves (making roughly a teaspoon of ground cloves), and by substituting the walnuts for flaked almonds (because this is all that I had :) ). The resulting muffins are a rather pretty, deep golden brown, studded with ruby red cranberries. They taste sharper than the usual muffins that I favour because of the cranberries and the cloves, but these are two wintery foods that complement each other well. To check out the many great ways to use cloves in your cooking, check out Gretchen's site once the roundup is posted. ... the anniversary of the first major military action fought by Australian and New Zealand forces during the First World War. ... the "ANZAC legend" became an important part of the national identity of [Australia and New Zealand]. This shaped the ways they viewed both their past and future. On ANZAC Day, we remember those who fought for Australia in all wars, not just at the battle of Gallipoli. Dawn services are held in cities and towns across Australia to commemorate ANZAC Day, followed later in the day by street marches of present and past members of the armed forces and their families. A type of oatmeal cookie has been named after the ANZACs, and it is made, not just to commemorate ANZAC Day, but all year round in Australian and New Zealand households. It was originally made by women to send to their soldiers hundreds of miles away, and consequently contains ingredients that do not readily spoil. You can read more information about the history of the ANZAC biscuit here. Combine all of the dry ingredients in a large bowl and set aside. Melt the butter and golden syrup in a small saucepan on the stove top, then remove from the heat. Combine the bicarbonate of soda with the boiling water in a cup, and pour into the melted butter mixture. This will cause the butter to foam up. add the butter mixture to the dry ingredients and combine well. Grease 3 or 4 cookie sheets. Drop teaspoonfuls of ingredients onto the cookie sheets, leaving plenty of room for spreading between each biscuit. If you make them too big, the biscuits will spread into one another and you will end up with one enormous cookie! Bake the cookies in the preheated oven for approximately 20 minutes until golden. Remove the biscuits from the oven and cool on the cookie sheets for 5 minutes before carefully placing on a wire rack to cool completely. Store in an airtight container. These biscuits are absolutely delicious, and are a favourite of my work colleagues. Funnily enough, because Mum made them regularly at home, as a child I didn't think much of them. However, maturity has caused me to reflect on ANZAC biscuits in a different light, and I now adore them. This week, I felt like some comfort food for dinner, as we have just started to really get into autumn (although the warm daytime temperatures are lasting). With some leftover chicken in the freezer and my love of spicy (but not too hot!) food, I thought that the perfect choice would be chicken tikka masala. I lived in London for 12 months about 6 years ago, and during that time, I learned that chicken tikka had replaced fish and chips as the British national dish. There are some absolutely super curry houses around Brick Lane in the East End that make delicious and inexpensive curries, including chicken tikka. However, I also had some abysmal chicken tikka while in London, featuring huge chunks of red "glow in the dark" chicken which was weirdly stored in large bowls in the unrefrigerated windows of take out stalls at markets such as Spitalfields and at convenience stores. Spurred on by the memory of some fabulous chicken tikkas from Brick Lane, I forged ahead with trying quite a few of these glowing abominations before giving them up as a bad job. Despite this, I have a soft spot for chicken tikka, as it always reminds me of my time in London. Back in Oz, chicken tikka is commonly available at Indian restaurants, even though I believe that it is an entirely Anglicised concoction, and that traditionally, Indians would not make it. To make the chicken tikka pictured at the top of this post, I used this recipe from Australian Good Taste. The only strange thing about this recipe is that it suggests the use of tandoori curry paste rather than chicken tikka curry paste. However, for once I obeyed the recipe, and I loved the resulting colour and flavour of the dish. As you can see, the chicken is orangey red, but nowhere near "glow in the dark". 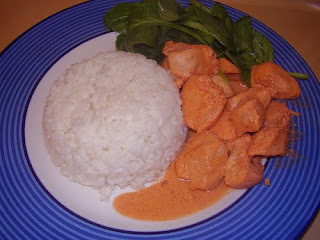 The inclusion of the spinach in the recipe is genius - it really makes the dish, with its green crispness contrasting nicely with the tender, spicy, orange coloured chicken. My only diversion from the recipe was to serve the curry with boiled rice instead of pappadums. All I can say is - delish! Amrita from La Petite Boulangette is hosting this month's Sugar High Friday, and has chosen an Asian Sweet Invasion theme; that is, make something sweet with an Asian twist. She suggests that, rather than making a traditional Asian dessert, we incorporate an Asian ingredient into a traditional dessert. Bearing this in mind, I found this recipe for Green Tea and Vanilla Panna Cotta with Chocolate Sauce on Nordljus's blog. I liked the sound of one of my favourite Italian desserts with the Asian twist of a green tea infusion, so I have made this dessert as my entry for SHF. I was pleased with the end result - this dessert was very smooth, and had a subtle but not overwhelming green tea flavour which gave an edge to the sweetness of the panna cotta. The chocolate sauce complemented the panna cotta well, but is not strictly necessary. I think this dessert would be perfect at a fusion food dinner party, as it looks stylish and elegant, and is a little bit different to a traditional panna cotta in taste. Thanks to Amrita for hosting this month's Sugar High Friday, and do watch out for the roundup on her blog next Friday. Lee works in our accounts section. He is lots of fun to work with, and really cares about helping out, even if our business colleagues are sometimes unappreciative of his efforts. Lee is on a diet and looks wistfully at my cakes each week, so he asked if I could make something low fat so that he could have some. Having recently acquired a second hand copy of Alice Medrich's Chocolate and the Art of Low Fat Desserts, I was very happy to oblige. Lee selected Alice's Chocolate Marbled Cheesecake, which as you can see from the photograph above, is a rather gorgeous looking dessert. Preheat oven to 170 degrees Celsius. Line the base of an 8 inch spring form pan with a circle of baking paper, and spray the sides with canola oil. Wrap the outside of the pan tightly in 3 layers of alfoil. Blitz the cottage cheese in a food processor for 3 minutes until totally smooth (this is the secret of the dish, according to Alice). Soften the cream cheese by warming the cream chese in a micriwave on high for about 30 seconds, and stir until smooth, then add to the cottage cheese in the food processor with the eggs, sugar, vanilla essence, lemon juice and salt. Blitz the mixture on the food processor until smooth. In a jug, whisk together the cocoa, coffee, sugar and hot water. Take a cup of the cheesecake batter and add to the chocolate mixture, and stir until combined. Pour three quarters of the white cheesecake batter into the prepared pan. Next, pour the chocolate cheesecake batter into the middle of the white batter, so that is forms a circle of chocolate on top of the white, but leaving a thick ring of white batter surrounding it. Finally, take the last of the white cheesecake batter and pur it into the centre of the chocolate batter, leaving a thin ring of chocolate around the last white addition. Next, get a thin knife or skewer and make circular swipes through the batter to marble the colours (but don't over-mix unless you want an all-chocolate cheesecake!). Boil a kettle of water. Put the cheesecake pan into a baking dish, and pour boiling water around the cheesecake into the baking dish (carefully so as not to get any into the cheesecake itself) to a depth of 3cm. Carefully slide the baking dish containing the cheesecake and water into the preheated oven, and bake for around 45 minutes. Remove the cheesecake from the oven, take it out of the oven dish and place it on a wire rack to cool. 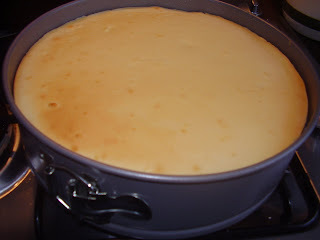 Once the cheesecake has cooled to room temperature, cover and chill it in the refrigerator for at least half a day. To serve, release the cheesecake from the springform pan and press the crushed biscuit crumbs evenly around the sides of the cheesecake (which is admittedly a rather messy and wasteful task). Cut the cheesecake with a knife dipped in hot water and wiped dry between cuts for a smooth, even finish. While this cheesecake is not, in my view, as good as the full fat version, it is really delicious, and looks amazing. One colleague told me that she liked it better than the full fat equivalent, which is terrific. Accordingly, even if you are counting fat and calories, you don't have to miss out on favourite desserts like cheesecake - which is good news for all of us. On a cool night, there is nothing like lasagne to warm you inside and out. Although I am not afraid to eat the full fat version of lasagne, I am in favour of healthier eating, so the lasagne pictured above is a reduced-fat version made from a recipe in Eat Well Live Well with Diabetes. I am not a diabetic, but I purchased this book for its great low GI, low fat recipes. I find making lasagne rather time consuming, so I do not make it often. This version contains a lot of vegetables which have to be chopped, making the preparation time longer than for other versions of lasagne that I have made. While this dish tasted fine, I like my tried and tested lasagne recipe, in which white sauce is layered with the meat and pasta, better, as it gives a moister result. Cook the onion in the oil on the stovetop until the onion is soft. Add the celery, carrot and zucchini to the pan and cook until the vegetabkles are soft, then add the garlic and cook for a further minute. Add the mince to the pan and stir while cooking until the mince has browned. Add the tomatoes, tomato paste, stock and oregano to the pan, season to taste with salt and pepper and combine well. Bring the meat sauce to the boil, cover and simmer for 20 minutes, stirring from time to time. Preheat your oven to 180 degrees Celsius. Put a layer of lasagne sheets in the bottom of a well oiled lasagne dish, then top with a third of the meat sauce; cover with another layer of lasagne sheets, and a further third of the meat sauce; repeat once more. Top the final layer of meat sauce with another layer of lasagne sheets. Make a cheese sauce by forming a smooth paste with the cornflour and some of the milk in a small saucepan over low heat, then gradually add the rest of the milk, stirring constantly, until the sauce boils and thickens. Remove the sauce from the heat and stir through the grated cheese while the sauce is still hot. Spoon the sauce over the top of the lasagne, then place in the pre-heated oven and bake for one hour. Remove the lasagne from the oven and allow to sit for around 10 minutes before slicing and serving with salad or vegetables. Enjoy! Above is a photograph of me and some of my work colleagues (former and current) at a social function involving a cruise down the Yarra River last year. I am the girl in black at the back of the photo chewing a friend's ear off, demonstrating one of my "qualities" - forthright. The dress code for the cruise was 1980's (and no, I don't normally dress like this). It was the best work function that I have ever attended, and I had a ball. Hope you all had a great weekend folks! Chris from Mele Cotte is hosting Cooking to Combat Cancer 2 to promote awareness and prevention of cancer. She is seeking healthy recipes utilising ingredients that combat cancer. I admit that I had to do some research for this event. I had heard of anti-oxidants and "super foods", but wasn't entirely sure what foods fell into this category and what you could make with them. After some reading, I learned that orange and yellow foods help to combat cancer. 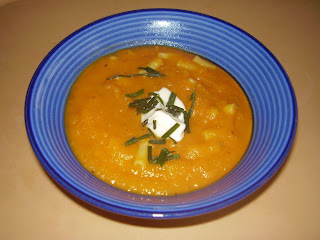 After searching through my recipe books, I found a great recipe for Sweet Potato, Pasta and Leek Soup in the Australian Heart Foundation's Deliciously Healthy. The key ingredient in this hearty soup is sweet potato (kumara), an orange food, which helps to combat cancer because it contains anti-oxidants - namely, beta-carotene and Vitamin C. Anti-oxidants work by neutralising free radicals in the body, which damage cells and cell membranes, in turn triggering cells to become cancerous. The soup contains saffron. 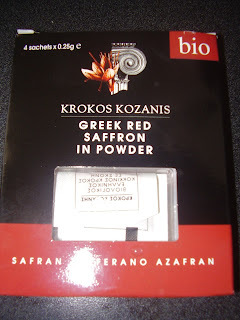 I was in luck, because my wonderful friend Ivy from Kopiaste recently sent me a parcel all the way from Greece which contained ouzo, gum mastic and Greek red saffron. I therefore was able to use some of Ivy's saffron in this soup - thanks Ivy! Cook the leeks in the oil in a large saucepan until soft. Next, add the sweet potato and saffron to the pot and cook for around 5 minutes. Add the stock, cinnamon and bouquet garni, bring to the boil and then turn down the heat and simmer for half an hour. Discard the cinnamon stick and bouquet garni, and puree the mixture in small batches until smooth. Place the puree back in the saucepan with the cooked pasta and reheat the mixture. Add water to the soup if it is too thick (I needed to add about a cup of water). Serve the soup garnished with a dollop of yoghurt and some chopped chives. Thanks to Chris for hosting this event, and do check Chris's site for the roundup here. Giz and Psychgrad from Equal Opportunity Kitchen are hosting a blogging event with a theme of Tried, Tested and True. As the name suggests, this event features a roundup of recipes from around the blogosphere which are "tried, tested and true", and always get good results. For my entry, I am contributing my mother's stew recipe, which she calls "Hotch Potch". Basically, it is one of those great dishes where you can toss in almost any type of vegetables, sauces and flavourings that you have on hand in with some diced beef, stew for a couple of hours and hey presto - you get a thick, rich, satisfying stew. My mother often made this dish when I was a child, and I adored it - still do. My brother, on the other hand, is a perennial picky eater, so Mum would have to cook his beef separately from everyone else's as he doesn't like the hearty sauciness of hotch potch. This stew is great served with thick, crusty bread to mop up the gravy. Preheat your oven to 180 degrees Celsius. Place all the ingredients other than the cold water in a casserole dish, then fill the dish with just enough cold water to cover the meat and vegetables. Put the lid on the casserole dish and cook in the oven for around 2 hours. This stew is brilliant on a frosty night, as it warms you inside and out. Thanks to Giz and Psychgrad for hosting this event, and I look forward to the roundup. To do this for my 4 oysters, I "blitzed" 2 slices of stale bread in the food processor to create breadcrumbs. I then mixed those breadcrumbs with a dessertspoon of melted butter, a teaspoon of lemon pepper and 1/2 teaspoon of paprika, and baked the mixture on a foil lined tray at 180 degrees for 15 minutes. Take 4 oysters, squeeze a twist of lemon on each, sprinkle each liberally with the baked bread crumb mixture, then bake in the oven for about 5 minutes. Serve! In the top photograph, the bottom row of oysters is once again au naturel with a twist of lemon, which is still my favourite way of serving oysters. However, I enjoyed both of Jo's suggestions, even though I found that the lemon pepper breadcrumbs tended to overshadow the taste of the oysters themselves. This is a matter of personal preference only, and all methods tasted delightful. I hope that this provides you with some inspiration for the next time that you take some oysters home from the market. Before I go, I want to send a big thank you to Joy of Joy of Desserts, who has nominated me for an Excellence Award. Thanks Joy! Check out Joy's recent post about banana jam waffles - it will set your mouth watering. Not so long ago, Tammy from Wee Treats by Tammy posted about her family recipe for Belgian slice. This slice is very popular in New Zealand, although my research suggests that its origin is British (how about that for an identity crisis?). I had bought a piece of Belgian slice, and did not think that much of it, but Tammy's slice looked so good that I decided to give it another chance and make it myself. This week, I used Tammy's recipe to make Belgian slice for work. And the verdict? This slice in its home-made incarnation is delicious! It is rather sweet, but not at all dry like the bought equivalent. I cut my slice into small pieces so that it was just enough sugar-hit to make you feel satisfied. It was a hit at work (yay! ), and I sent the link to the recipe to someone. If you decide to make this slice, just one word of warning to protect the innocent - the pastry is very soft, but when Tammy says roll it out, please roll it out! I thought that it would save me a lot of palaver just to press the pastry into the slice tin, and this worked a treat for the bottom layer of the slice. However, the pastry is not soft enough to press nicely over the top of the jam, so I ended up with a sticky amalgam of pastry and jam when I tried to press the top layer of pastry over the jam. Most of you probably worked this out without me having to tell you, but I did it (and binned the result), so I thought it was worth mentioning. This slice is perfect for an elegant ladies afternoon tea party - I could see it on a pretty cake stand with scones and cucumber sandwiches at a British hotel for high tea. If you love sweet, cinnamon-flavoured treats, this slice is for you. A little while ago, Susan at Foodblogga made Honeyed Orange Ginger Muffins. I thought that these looked and sounded devine, so I filed the recipe away to make for myself. I finally got around to making these muffins this week, and boy are they good! I used sultanas instead of raisins and forgot the honey (because my head is sometimes not screwed on straight when I am baking), but they tasted really good, all the same. If you love citrus and ginger flavours, and don't object to raisins in your baked goods (some people have an aversion to this! ), then give these muffins a go - they are delicious. The first dish which I tried out of Wild Garlic ... is a spinach, chickpea and eggplant curry. As ever, I made some minor modifications to the original recipe depending on taste and what ingredients I had available. I have to say that I was at first repulsed by the finished result because it was well - so green! I don't know what I expected given that the recipe calls for a kilo of spinach, but its greenness still took me aback. However, one mouthful and I was able to overcome the visual repulsion that I felt for this dish. It actually tastes very good, and I have been taking it to work for lunch this week. An unfortunate side effect of eating this curry is that little specs of green sometimes rest on your teeth, giving you a not-so-perfect smile, so I recommend brushing your teeth or sluicing your mouth with a drink after eating it so you can ensure that you retain a Macleans smile. Boil the silverbeet for 2 minutes, then run it under cold water to cool. Squeeze out as much liquid as possible, then puree the silverbeet. Cook the onion, chickpeas, garlic, fennel seeds and cumin for roughly 5 minutes in a frypan containing 2 tablespoons of heated cooking oil. Add two more tablespoons of cooking oil and the diced eggplant, and cook for about 10 minutes. Finally, pour in the tomatoes and season to taste, and simmer for 15 minutes. Add the silverbeet puree and combine well. Simple! Don't be put off by my photographs - if you like spinach (or silverbeet! ), this dish tastes good. I was surprised by how much I like this curry, especially given I was a child who hated vegetables (hence my initial psychological barriers related to the greenness of this curry). At my choice, I started with a drink at the well stocked bar, as I arrived twenty minutes early after overestimating how long it would take to get there from my inner city hotel. Even before I arrived at The French Cafe, the service was remarkable. I left some very garbled telephone messages to arrange my booking both from Australia and while in New Zealand, and the staff on each occasion promptly and courteously returned my calls. There are not many restaurants that will return an overseas phone call to confirm a booking. Throughout the meal, the service was also impeccable. My waitress was friendly, attentive and helpful, and my water glass was regularly topped up by another smiling waitress. 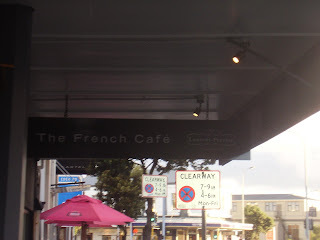 At The French Cafe, you have a choice of two tasting menus or you may dine a la carte. The tasting menus were popular on the night of my visit, but I knew that I would not be able to handle these (with 6 and 11 courses respectively), so I chose the a la carte menu. On this occasion, I selected an entree and a main meal, resisting my beloved dessert course. To start, I was served an amuse bouche of warm carrot and ginger soup with coconut foam. If you had asked me whether I liked carrot soup previously, I would have said no, but this soup was delicious. I am also a ginger lover, so the flavour combination was very appealing to me. This tart was exquisite in both appearance and taste, and was surprisingly light, making it a perfect starter. The tart base was crispy, puffed pastry, which served as a vehicle for the delicious flavours of the topping without overshadowing them. 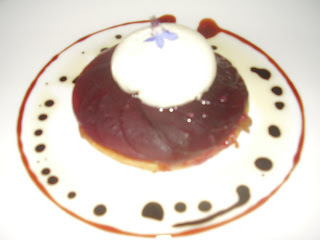 The delicate violet atop the goat's cheese crown of the tart set off the regal purple beauty of this dish. 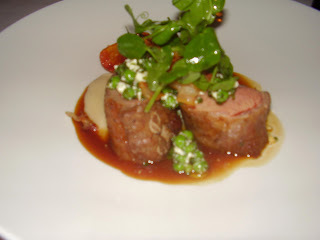 The lamb was tender and delicate in flavour, and I was surprised by how much I enjoyed the white bean puree, a vegetable dish that I would not be automatically drawn to had it not been part of the meal. 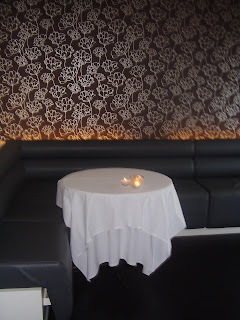 If you have a very hearty appetite, there is also a wide selection of side dishes available, and a lovely dessert menu. Alas, I could not eat another thing. I accompanied my meal with two glasses of the Lamont 2006 Riesling from Central Otago and completed the experience with a flat white coffee. This was another enjoyable dining experience, although it was very different in atmosphere and style to the equally excellent Martin Bosley's Yacht Club Restaurant. If you are lucky enough to visit Auckland and Wellington, I highly recommend both establishments. Each provides a gastronomic experience which is as memorable and enjoyable as the many natural wonders that New Zealand has to offer. Postscript: If you are interested in my general travels around the North Island of New Zealand, I will post about these on my travel blog shortly and link to them from this post.